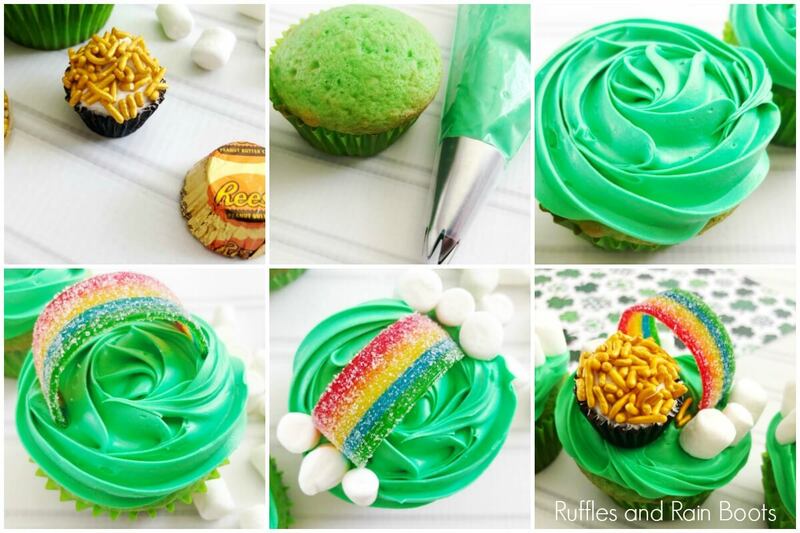 These easy pot of gold cupcakes for St. Patrick’s Day will have everyone smiling! They are surprisingly easy, so grab the kids and let’s get started. 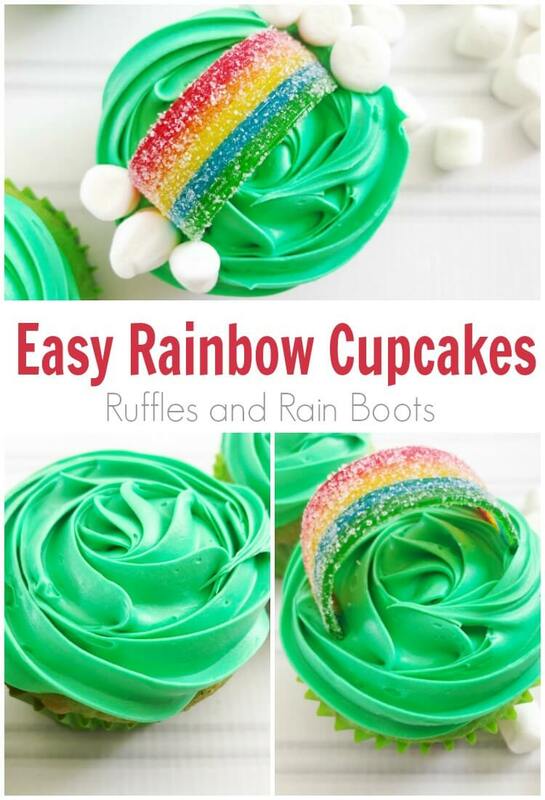 Here at Ruffles and Rain Boots, I love to share fun cupcake decorating ideas for holidays, parties, and rainy day fun in the kitchen. And this time of year, it’s all about bringing in the bright colors to chase away the dreary winter days. 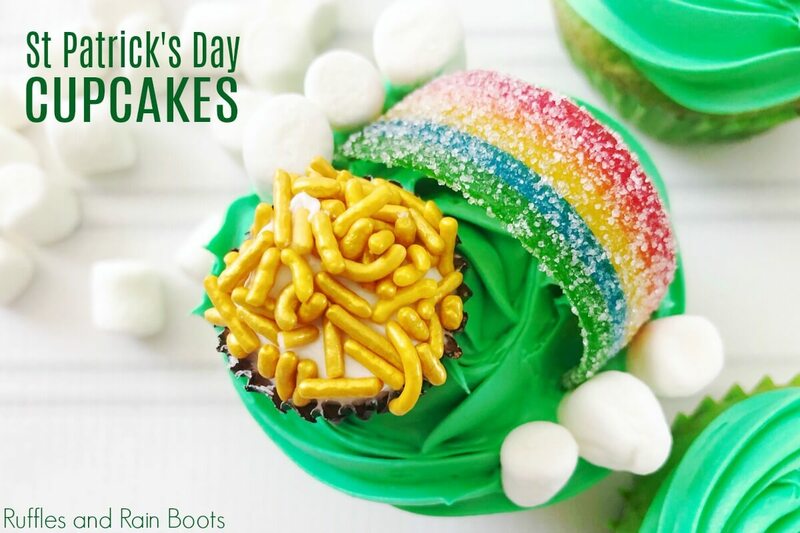 These pot of gold cupcakes for St. Patrick’s day are fun and festive. The mix of bright greens, rainbow, and shiny gold sprinkles will have anyone grinning from ear to ear. Le’ts get started making these! No Time to Make These Now? Pin for Later! If you’re on mobile right now or can’t whip up a batch of these fun cupcakes, pin them to your favorite cupcakes or St. Patrick’s Day board on Pinterest. They’ll be there when you’re ready. I like to provide options to everyone because not everyone likes over-the-top cupcakes. If you want to make rainbow cupcakes, just don’t add on the pot of gold. Easy peasy, right? They’re so cute just as a fun rainbow food idea! 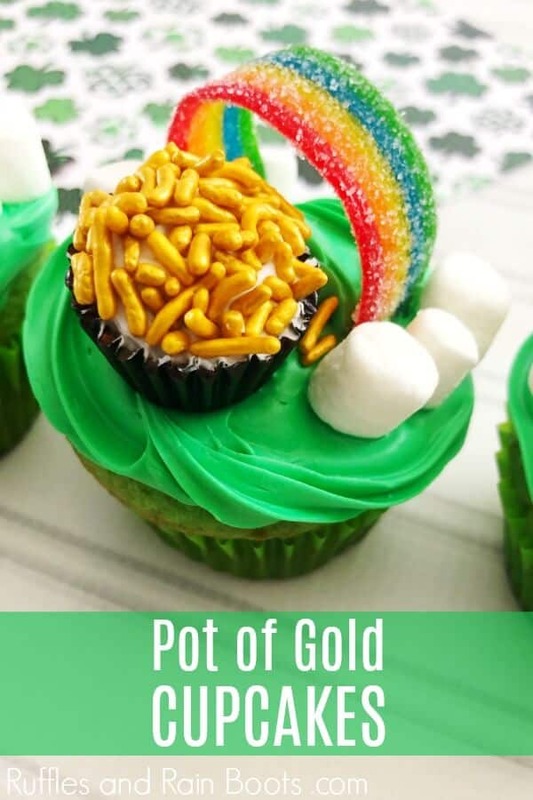 How Do I Make Pot of Gold Cupcakes? I’m so glad you asked! Scroll to see the written instructions and recipe on how to make these fun St. Patrick’s Day cupcakes. If you’re making a playlist for the holiday, here is our Pot of Gold cupcakes video tutorial on YouTube. 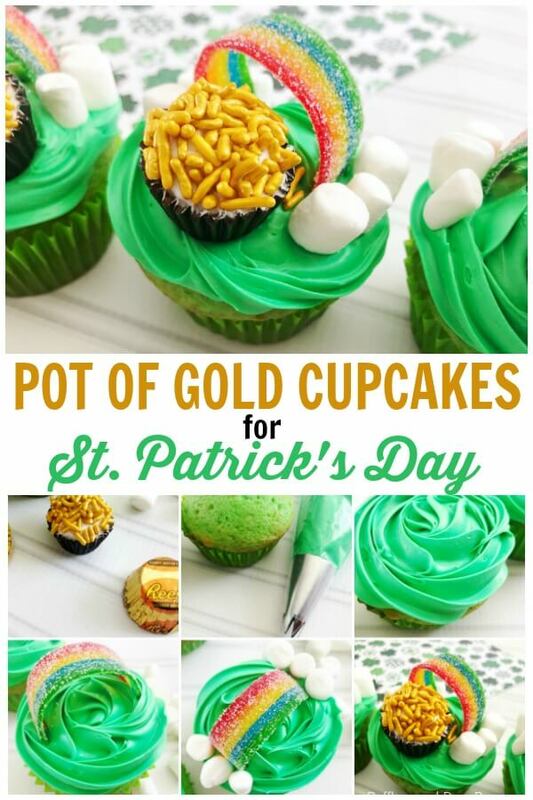 These pot of gold cupcakes are perfect for St. Patrick's Day. For a bit of variation, leave off the gold treasure and make the easiest rainbow cupcakes, too! Bake our amazing vanilla cupcake recipe (doubled) with the addition of green food coloring. Let cool. While the cupcakes bake, unwrap 24 mini Reese's peanut butter cups, leaving it in the liner, and place a small dollop of frosting on top. Dip into the gold sprinkles and set aside. Color the remaining frosting with green food coloring (we prefer the gel for more vibrant color). Transfer the frosting to a piping bag with a large star decorating tip. Frost the cooled cupcakes from the center, working your way out to the edge. Cut the rainbow candy into 3.5 inch pieces. Place one off center on the cupcake and add three mini marshmallows on either side of the rainbow to act as clouds. 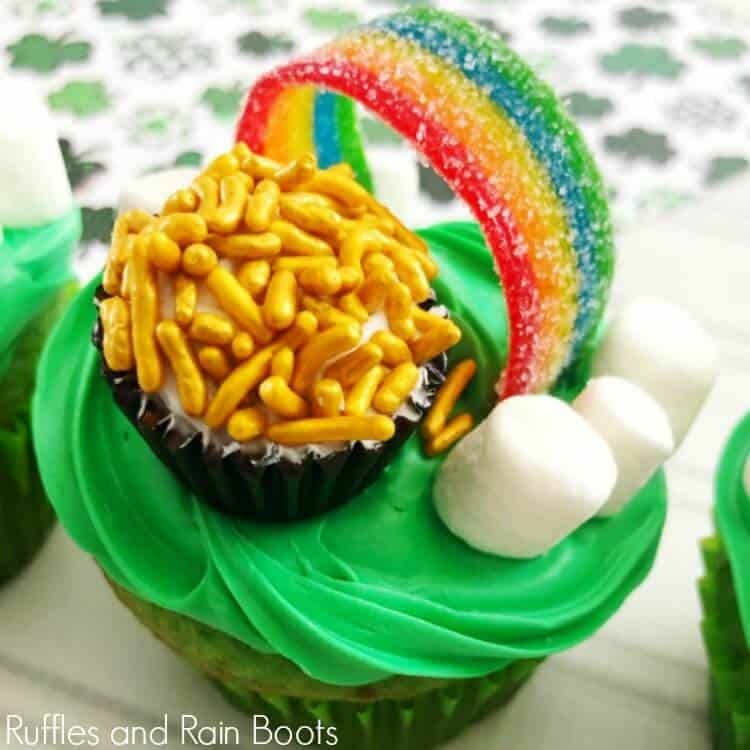 Place the Reese's cup in front of the rainbow decoration and you're done with these fun pot of gold cupcakes! All nutrition information is estimated and does not include all recipe elements. Please calculate your exact brands and ingredients when accuracy is desired. RELATED READING: St. Patrick’s Day Bark – Colorful, Tasty Fun!